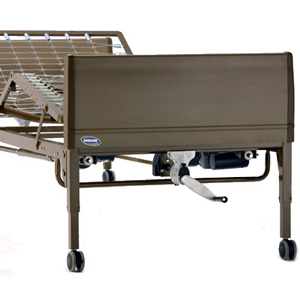 Universal Bed Ends work on manual, semi-electric, and full-electric IVC and original Invacare home care beds as both the headboard and the footboard. High-impact bed end panels are more durable, scratch-resistant, and washable for easy cleaning. High-impact bed end panels are more durable, scratch-resistant, and washable for easy cleaning. Non-marring casters with tread track better. Enhanced caster sockets provide better retention during delivery and set-up.